代名詞とも言えるサークル作品は、錬度を増し樹脂に閉じ込められた毛糸が、温かく、柔らかく、瑞々しく見る者に静穏を与えます。本展では流木、ビーチプラスチックを用いた新作、2018年にロサンゼルスとテキサスのグループショーで発表し好評を博した作品も含め30点以上を展示、またシルクスクリーンやプロダクト作品の販売も予定しています。 “yesterday . today . tomorrow” by hi-dutch2019/2/1(fri) – 2/19(tue), 2019＊opening reception on 2/1(fri) 7-9pm＊open from 12-7pm / closed on Sunday & Holiday hi-dutch / Takahiro Hida1972年生まれ。サーフボードリペアのキャリアにより習得した樹脂を用いた技術を用いて、毛糸、木材、樹脂を合わせた表現を続けている。日本各地で作品展やグループショー、店内装飾などで作品を発表。また、アメリカ（サンフランシスコ、ロサンゼルス、テキサス、サンノゼ、ハワイ）香港、台湾（台北）オーストラリアなどのグループショーに参加するなど海外でも作品を発表している。 GALLERY TARGET is pleased to announce the first exhibition of year 2019, “yesterday . today . tomorrow” by hi-dutch.The exhibition titled “yesterday . today . tomorrow” consists of new body of art works which are the extension of his everyday life, going to beach and doing daily routings. With his masterpiece “circle” (resign and yarns), hi-dutch will be exhibiting art works with driftwood and trashes found on beaches as well as works exhibited at a traveling group show (Los Angeles and Texas), on top of over 30 new body of art works. We also are scheduled to release silkscreen print and products created by hi-dutch. “yesterday . today . tomorrow” by hi-dutch2019/2/1(fri) – 2/19(tue), 2019＊opening reception on 2/1(fri) 7-9pm＊open from 12-7pm / closed on Sunday & Holiday hi-dutch / Takahiro HidaBorn in 1972Technique using resign was developed through his career of repairing surf boards. 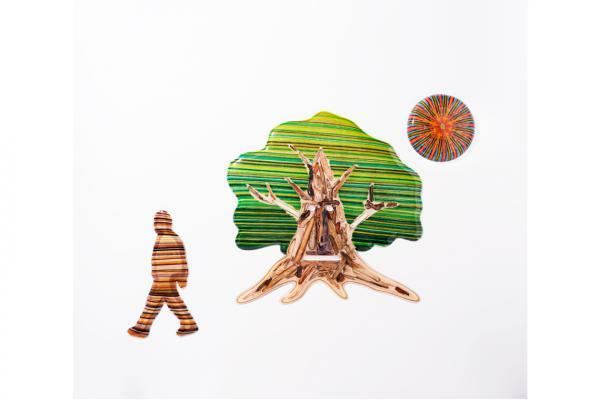 hi-dutch has been creating art works with resin combinining with yarns, woods and other materials. He has been exhibiting his works not only at galleries but at stores in various cities including, San Francisco, Los Angeles, Austin, San Jose, Hawaii, Taipei and Australia.